No holiday season would be complete unless we had food, don't you think? I agree. So today we have a special treat for you! My friend Jillian from Food Filled Life is here to share one of her family's traditional recipes. I just know you will love it! Dominic grew up with food as traditions, and traditional food. My wonderful Mother In Law, Madge, has been eating this Christmas bread recipe since she was a little girl. Her mother Marian always made it the day before Christmas, and while the the whole family was opening presents on Christmas morning, they were happily eating buttered toasted slices of Christmas bread. Madge loved this tradition so much, she carried it into adulthood, and like her mom, every year she made Christmas bread for her family the day before Christmas. Their family has a present opening tradition as well. They have always opened their stockings first. They then take a break, and eat Christmas bread. Then they move onto the presents under the tree, always taking turns, and opened presents one at a time. The whole process can traditionally last for an hour or two, and they snack on Christmas bread the whole time, it is marvelous. The original recipe, Swedish Bread is from the Boston Cooking School Cookbook(now known as The Fannie Farmer Cookbook), By Fannie Merritt Farmer. 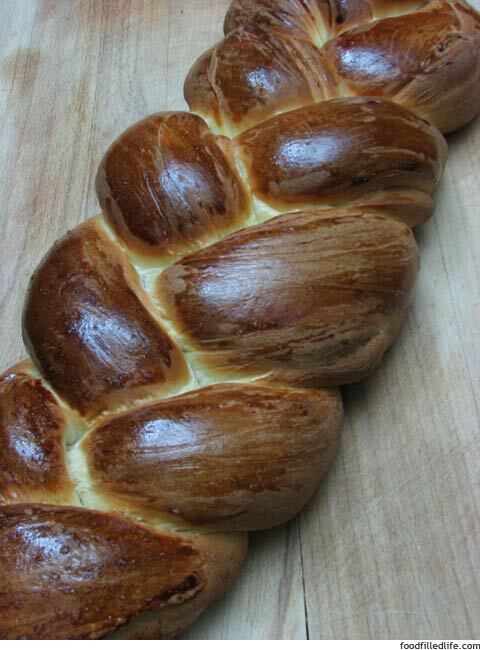 You can make this bread in a loaf pan, like Madge makes, or braid it like we have done here. The recipe does not call for citron, but Madge's Mother, Marian Barnes always made it with Citron. Madge used to make both loaves with citron, but when Dominic and his siblings were little, they told her they did not like the candied fruit. The next year, she started making one loaf with citron and one without. Madge and I were talking and we think this recipe originated from Mimi (Molly Baker) Barnes, My mother in Laws, Grandmother, because she was from Boston, and was a huge fan of Fannie Farmer. We think that she married into this recipe. While we were making this recipe, Madge shared a funny story about her grandmother. Mimi was a very prim and proper woman and was always a lady, whether she was at a formal dinner or camping. She was at a formal dinner one evening, and was discussing cookbooks with a small group at the table. She was in the middle of a comment when there was a pause in the table conversation. The pause was so prominent and the room was so quiet, that everyone heard her exclaim, "it's always good to have a fannie to fall back on." Being from the Victorian Era, she was mortified, and this story has been told throughout the generations, followed by much loving laughter. I hope you make and share this Christmas bread for your family and friends, and your home is filled with love and laughter the whole season and beyond. Hi! My name is Jillian. I am a food lover who grew up on TV dinners and eating out at restaurants. I always liked gathering in the kitchen, while others were cooking. I am married to a wonderful man who is ironically a formerly trained chef. We have two loving, wonderful, imaginative, high spirited girls who also love to eat and enjoy tasty food. About four years ago, I started cooking food that was either inedible or barely edible. I was extremely frustrated and just kept practicing. Just in the last couple years, I have thoroughly enjoyed being in the kitchen, as the cook. I love creating daily beautiful, healthy, flavorful meals for my family and friends. I am blessed to live in Oregon, and to have amazingly fresh, organic produce available most of the year. I still struggle at times, with barely edible creations, but I get back in the kitchen and try it again. I am now truly, thankfully living a food filled life. For more stories and delicious recipes, you can find Jillian at her blog, Food Filled Life.